An offer you can't resist? 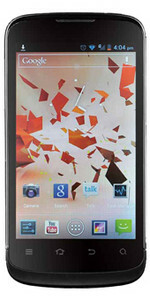 ZTE's Blade III is a 4 inch smartphone that is available for less than 100 Euros (~$133) on the internet. Is it worth the money or are there better offers for users looking for an entry-level smartphone? Qualcomm Adreno 200: Integrated GPU in the Snapdragon S1 SoCs and based on the AMD Z430. Later called Adreno 200 with higher clock speeds. These graphics cards are not suited for Windows 3D games. Office and Internet surfing however is possible. » Further information can be found in our Comparison of Mobile Graphics Cards and the corresponding Benchmark List. S1 MSM7227A: Entry level Soc with one Cortex-A5 processor core and a Adreno 200 GPU.» Further information can be found in our Comparison of Mobile Processsors. This is one of the smallest diagonal for smartphones.